At first glance, the monolithic Ant House's seemingly windowless and dark metal-clad facade looks more like a high-level security building than a single-family home. But despite its daunting appearance, the Ant House is actually home to a warm and cozy interior filled with natural light and plywood paneling. 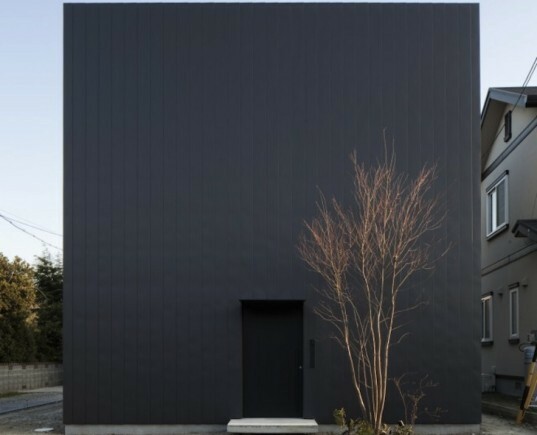 Designed by mA-style architects, the compact and contemporary home is located in Japan's Shizuka Prefecture and was created with the playful element of surprise. Completed in 2012, the 713-square-foot Ant House design encapsulates the mA-style architects’ signature minimalist and playful style, which relies on ambiguous spaces and a restrained materials palette dominated by larch plywood. 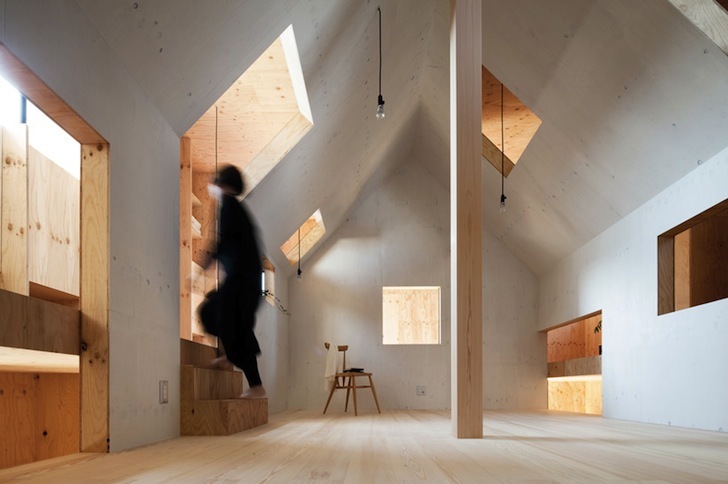 In contrast to the home’s cuboid exterior, the interior space is informed by a large gable-roofed structure that takes up the center of the home. This house-within-a-house concept serves as a fun and unexpected design feature and helped the architects divide the space to comfortably accommodate a family of five, without installing typical wall partitions. The living room, bathroom, and storage space are located on the first level of the gable-roofed structure, and are encircled by additional communal areas like the kitchen and dining spaces. The Ant House’s second floor comprises the bedrooms, with the adult bedrooms separated from the children bedrooms by a large “free space” in the gable-roofed structure. Large cutouts on the gable-roofed structure allow views across all the spaces, creating a home that appears to forgo the traditional concept of rooms. Natural light pours into the plywood-clad interior through skylights and tall side windows. In contrast to the home's cuboid exterior, the interior space is informed by a large gable-roofed structure that takes up the center of the home. Completed in 2012, the 713-square-foot Ant House design encapsulates the mA-style architects' signature minimalist and playful style, which relies on ambiguous spaces and a restrained materials palette dominated by larch plywood. This home-within-a-home concept serves as a fun and unexpected design feature and helped the architects divide the space to comfortably accommodate a family of five, without installing typical wall partitions. The living room, bathroom, and storage space are located on the first level of the gable-roofed structure, and are encircled by additional communal areas like the kitchen and dining spaces. The Ant House's second floor comprises the bedrooms, with the adult bedrooms separated from the children bedrooms by a large "free space" in the gable-roofed structure.
. Large cutouts on the gable-roofed structure allow views across all the spaces, creating a home that appears to forgo the traditional concept of rooms. Plan of the second floor.